Like many who work in global health and development, I look forward to the release of the Gates Annual Letter every January. Since 2009, I've excitedly perused the letter to see what child health goals Bill and Melinda Gates are prioritizing for the year. The 2015 letter is bold and inspiring, with the Gateses betting that, "The lives of people in poor countries will improve faster in the next 15 years than at any other time in history." Their daring mindset and willingness to set ambitious goals calls to mind another big bet—one undertaken 15 years ago, when languishing global immunization rates could no longer be ignored. Realizing the urgency of this issue, the World Health Organization, UNICEF, the World Bank, the Bill & Melinda Gates Foundation, and a group of national governments, vaccine manufacturers, civil society organizations and business leaders pooled their resources and expertise to form a pioneering partnership. Gavi, the Vaccine Alliance was born. 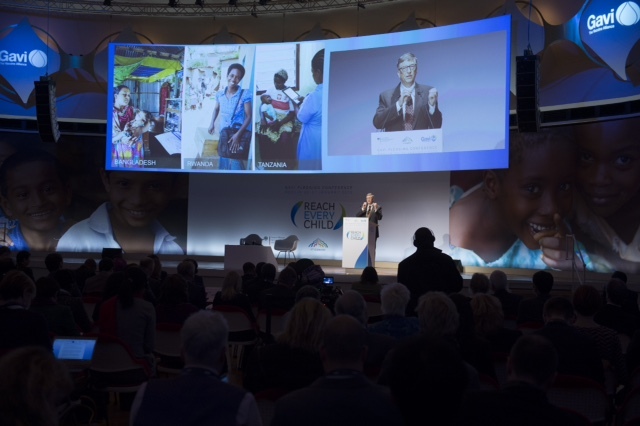 Then called the Global Alliance for Vaccines and Immunization and nicknamed "the Children's Challenge," Gavi's simple yet monumental purpose was to reach every child everywhere with vaccines against preventable diseases. At the World Economic Forum in 2000, Gavi's founders outlined inequity in three key areas as barriers to achieving universal immunization. Since then, Gavi has worked to lower these barriers, leveraging an innovative business model that finances the introduction of new vaccines in developing countries, while simultaneously reshaping the vaccine market. The three inequities remain relevant today, however, and underscore the urgency and significance of what Gavi does. The year Gavi was formed, 30 million children were born in developing countries without access to all the necessary immunizations, while nearly all children born in industrialized countries could count on immunization as a predictable part of growing up. In the 15 years since, Gavi's immunization programs in the world's poorest countries have reached 500 million children with vaccines and saved 7 million lives. 3. Investment in new vaccines. Historically, investments in vaccines against diseases most common in poorer parts of the world have not been prioritized. With the aim of correcting this imbalance, Gavi helps countries introduce vaccines against diseases that affect people in low-income areas, like Japanese encephalitis and yellow fever. Gavi has also agreed to consider support for a malaria vaccine if and when one is licensed, prequalified and approved for use. Elevating equity in these areas has driven Gavi for 15 years, and will continue to generate global breakthroughs if momentum continues to build—and the great news is that it already has. Last Tuesday in Berlin, donors stepped up with a historic $7.5 billion commitment to fund Gavi. These record-breaking pledges will help save another 5 million to 6 million lives by 2020, and nearly double Gavi's impact since 2000. Fifteen years after the original partners first committed, their bet will continue to pay off, in dividends of millions of lives saved and hundreds of millions of children immunized—and counting. Equity in health is a key priority at the Bill & Melinda Gates Foundation, and as part of their "Big Bet," Bill and Melinda wager that we can cut child deaths in half and eradicate more diseases than ever before by 2030. With 1 in 5 children still lacking access to lifesaving vaccines, we need Gavi to make good on their predication. Thankfully, donors agreed and, once again, went all in.